Pursuant to Article 8(1) of the Constitution of the Republic of Slovenia, laws and regulations must comply with generally accepted principles of international law and with treaties that are binding on Slovenia. Paragraph 2 of the same article states that ratified and published treaties shall be applied directly. This entails that the Republic of Slovenia recognises the primacy of international law over laws and other regulations of internal law, which, in the hierarchy of legal norms, places international law below the Constitution and above the laws. Through ratification and publication, the international treaties become an integral part of the domestic legal system, and only if their provisions cannot be directly applied in determining the rights and obligations of individuals is it necessary to adopt appropriate rules for their implementation. However, if their provisions are directly applicable (self-executing), they are to be used directly regardless of whether their content is reproduced in the internal regulations or not. 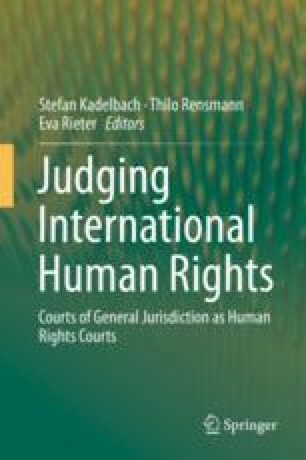 The European Convention on Human Rights is a ‘living instrument’ that develops continuously through its protocols and the case law of the European Court of Human Rights (ECtHR). In accordance with the principle of subsidiarity, it is primarily the duty of the Member States to ensure the protection of human rights. It is evident from a number of Constitutional Court decisions that this Court is well aware of its role. In many cases in which violations of Convention rights that are also enshrined in the Constitution were specifically alleged by the parties to the constitutional complaint, the Constitutional Court considered the complaints in the light of relevant constitutional rights, taking into account the standards set by the ECtHR. In some cases, the Constitutional Court, referring to the case law of the ECtHR, gave wider content to an individual right protected by the Constitution. Furthermore, it is evident from a number of the Constitutional Court decisions that this Court is familiar with the case law of the ECtHR and considers it in its decision-making, although it may not refer to it expressly. On the other hand, it should be noted that the Convention provides only minimum standards of human rights protection. Furthermore, the ECtHR grants the Member States a certain scope of margin of appreciation. Thereby, the Court acknowledges the specific characteristics of the legal systems of the Member States, as well as the political, economic, social and cultural situation in these states. This means that in cases where the ECtHR follows a restrictive approach, its case law should not be construed as an argument for a restrictive interpretation of human rights, which are afforded broader protection under the Slovene Constitution.